Coming out of the blue today, Microsoft’s monopolizing web browser, Internet Explorer, got an upgrade. The latest release candidate is now available for download, and it boasts new features, better compatibility, and better security than its predecessors. As a web designer, I’m obligated to try anything that could possibly eradicate the horrors caused by IE6, so I fired up the installer and tried it out so you don’t have to. 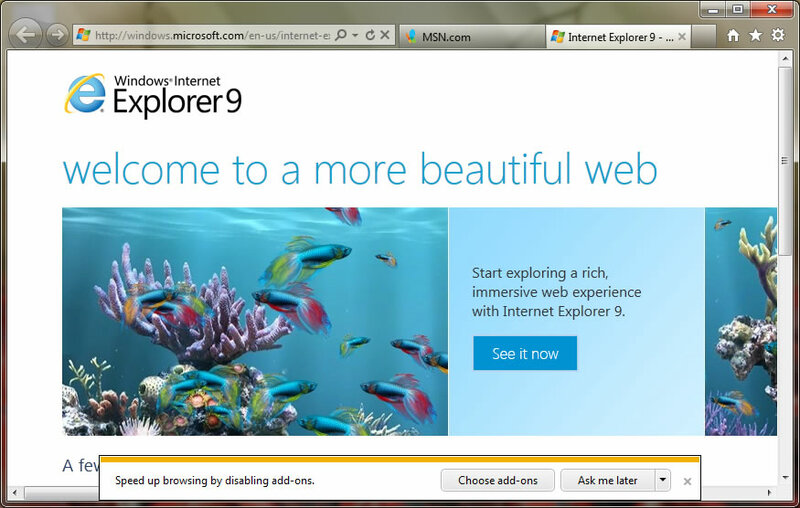 Right off the bat, the installer for Internet Explorer 9 RC is straightforward and simple. However, after installing, I was prompted with the useless “Your computer must be restarted to complete the install” dialog box. This wouldn’t be an issue if I wasn’t running my desktop as a 24/7 Counter-Strike: Source GunGame server. Since it could be a week before I get to restart my computer, I switched over to my netbook and started testing the OS there. Ok, it may be inconsequential, but Chrome doesn't make me restart, nor does Firefox. What gives? ﻿After restarting, IE9RC runs very smoothly. I’m going to go over some of the stand-out features of IE9, even though they’ve been covered before and aren’t remarkable or new to the RC. But hey, that’s just how I roll. 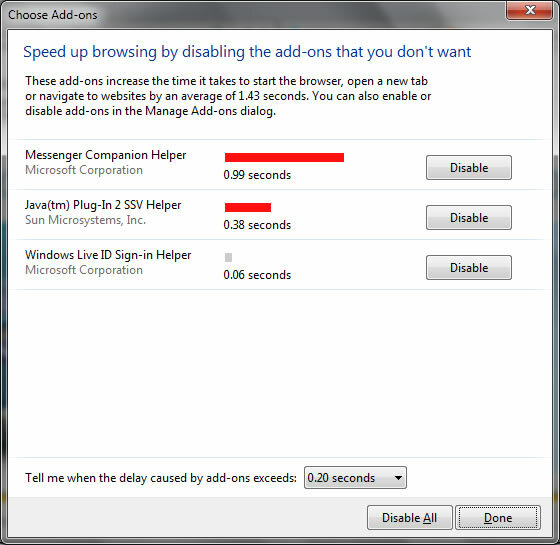 On the first launch, Internet Explorer 9 asks if you would like to disable any addons to increase the application's startup speed. The Disable Add-ons dialog shows all of your currently installed addons and shows a relative loading time in Microsoft Minutes for each one. On my Acre Aspire One, this feature significantly decreased my loading time. 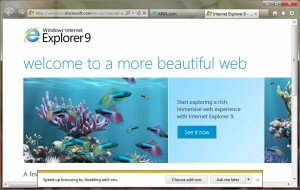 IE9 isn’t as snappy as Google Chrome, but it’s definitely faster than its predecessor, IE8. It seems like Microsoft took a lot of notes from its competitor’s browsers, such as a minimized address bar, removable tabs, and the “Your most popular sites” new tab page. The about:Tabs page displays a grid of "Your most popular sites", except instead of showing a screenshot of the page, it shows the favicon and a nice indicator bar which does something I'm not sure what it does. Is it more stable and secure than previous versions of Internet Explorer? Most likely. Is it a perfect browser? That’s hard to say. WIll it replace Google Chrome? Nope, not for me. Not yet. I’m waiting for a final release, and better CSS3 compatibility.